Does this kill vehicle contains momentum wheels? Watch how it moves! This comment below this answer about 'spacecraft' or at least 'craft' that can maneuver near the surface of low gravity bodies links to this video about Lockeed Martin's Multiple Kill Vehicle. If I understand correctly it is designed to operate for a short time (destructively) in space, but this test happens on Earth, presumably in normal atmosphere. I don't know the size but Gizmodo says it was at an altitude of 23 feet. I see a "main" thruster to maintain altitude (in the test, against Earth gravity), and a "left" and "right" thruster for translation and stopping, and four diagonal thrusters for "fine positioning", perhaps? Although the axes of the top pair meet above the spacecraft axis, and that of the bottom pair meet below, so perhaps they add translation and torque simultaneously? No matter though, it looks like all thrusters lie within a single plane of symmetry. The attitude seems quite stable throughout, even after falling and landing. By the way it moves, does it look like it has rotating intertia wheels of some kind, to maintain attitude? above: GIF made from frame numbers 300 to 326 extracted from this YouTube video. above: GIF made from frame numbers 459 and 460 extracted from this YouTube video. above: Lockeed's Martian Multiple Kill Vehicle - cropped from here. 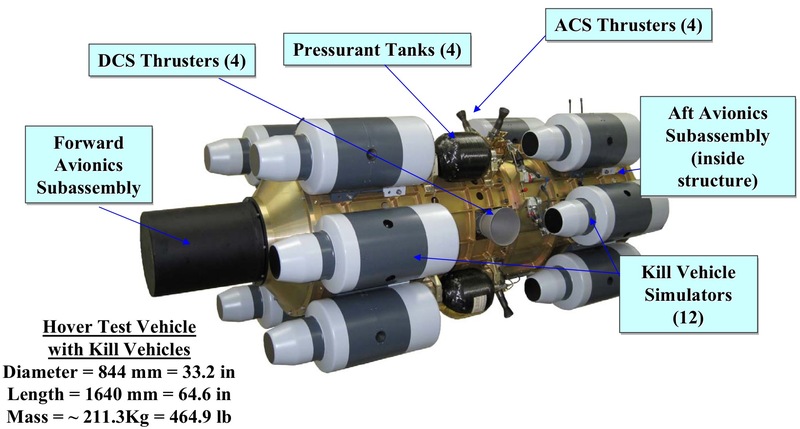 The thruster configuration can be seen better in this image: (cropped from this document ). The attitude control thrusters are not in plane with the direction control thrusters. This Raytheon patent on MKVs states that "attitude control system includes multiple thrusters offset from the center of gravity that provide yaw, pitch and roll control." All four of them are offset towards the aft, and the top and bottom pair are offset from the roll-axis. Firing one thruster provides torque on all three body axes, firing a second one compensates two of these axes and enforces the third. This does not rule out that reaction control wheels are used in addition. This older video mentions that the platform is "gyroscopicly balanced", which probably means that an IMU is used as guidance input. However the design objective of this device is to have many vehicles with independent steering at low cost and effort. This makes it feasible to choose such a simple thruster arrangement and put the burden on the guidance system (hard- vs. software). It is unlikely that reaction control wheels are employed from this perspective. I can only see 2 sets of engines used: Strong main engines (one on each surface) for up and side movement and 4 RCS ports for stability. As I viewed the video, I saw it was firing 2 RCS ports in almost each spot to maintain the position. This does indicate to me, that the whole stability is achieved by those RCS ports, as the sum of 2 orthogonal ports firing at the same time gives us a force along the mid of that angle between. To fight or induce a roll, just one of the ports would need to open or stays open a split moment longer. As this device seems to aim to be used in space, I would deem inertia wheels harmful even: the use of many moving parts in a device operating in a 3K environment (space) needs a very reliable method to reduce friction on permanently used parts like the axis of the inertia wheels. Such a method that also works equally good in a 0G environment I don't know of, indeed, a dry grease resulted in a catastrophic failure of a rover prototype. The different engines this device will need for mobility already demand the use at least the same ammount of motors or electric valves for the main engines and RCS ports to work and several more. However, I see some problems as that machine on the video does not yet seem to have a front/back engine set and lack RCS to control Pitch/Yaw too. As you can see in this older video, the main thrusters at center of mass (probably 4, but the upper one never fires; no need for it due to gravity pull) - are used for translation (dorsal/ventral; port/star) . Four smaller diagonal thrusters are used to provide pitch and yaw stabilization. There doesn't seem to be any fore/aft control because this being an interceptor/impactor it will be traveling in the 'fore' direction with as high a speed as the delivery vehicle can provide, no need to regulate it. The only remaining axis is roll, and it seems like indeed it's either maintained by a (single) reaction wheel - or not maintained at all - the device could roll and simply another thruster would take over given direction, but the test takes too short for that to matter. Alternatively the thrusters for it are minimal - comparing the thrust necessary to maintain roll comparing to other axis, they may be too minimal to notice their activity. Not the answer you're looking for? Browse other questions tagged attitude reaction-wheel flight-control adcs or ask your own question. 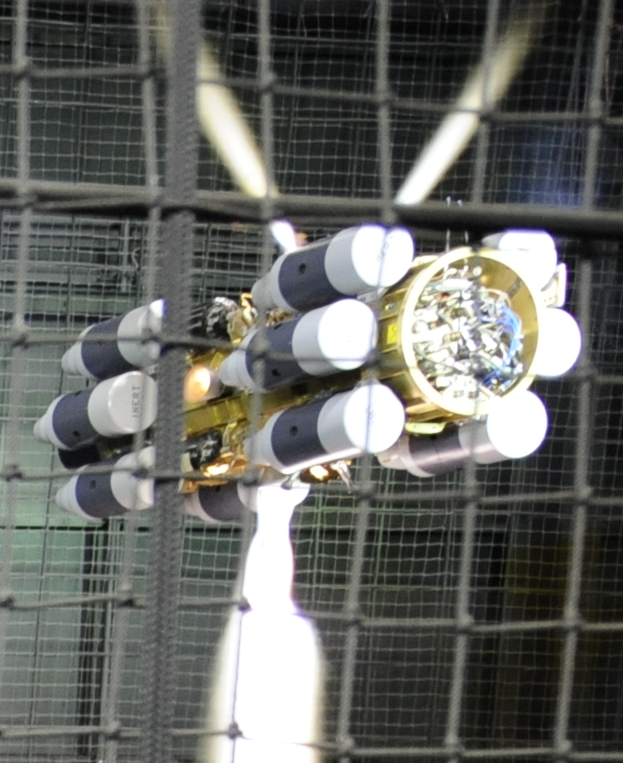 What did India's recently tested ASAT vehicle really look like? Have deep-space spacecraft always used some form of spread-spectrum for data downlink? Can gyroscopic stabilization be done without any rotating parts? What is the minimum number of RCS thrusters capable of stabilizing a satellite against an arbitrary rotation? What ever happened to SpinSat - did it work? How will GomX-4B manage angular momentum when using butane thrusters to move? Why does Orion's Jettison Motor, have four nozzles but eight Attitude Control Motors arranged in an octagon?